A trip to the agave fields of Tequila is closer than you think if you live at Lake Chapala. This outdoor block party used to shut down the two blocks on Colón leading to Ajijic’s malecón. Tequila’s world-famous agave fields are only 90 minutes from Chapala, easily accessible by car, tour van, or bus. Here are three ways to get to Tequila from Lake Chapala. The Victoria hotel runs tours a few times a month from Ajijic to Tequila. You’ll spend the day touring an agave field and a distillery with a professional guide who will lead you through the whole production procession, from the field to bottling. This includes visiting an agave field and the Tequila Selecto distillery in Amatitlán, just south of Tequila. You’ll taste a variety of tequilas at the distillery and then (at an additional charge of around $100-$200 pesos) everyone eats lunch at a local restaurant before heading into the town of Tequila to spend an hour on your own. Total cost is $780 pesos per person. Consult their website for more details and upcoming dates. Tours are limited to 13 people. If you’ve got your own wheels, this route via the macrolibramiento avoids potential traffic on the Ajijic-Jocotepec highway and gets you to Tequila in just under 90 minutes on a good day. From Ajijic, you can get to Tequila in three hours, plus the time it takes to change buses at the “old” bus station in Guadalajara. Here’s how. Tequila Plus is the main bus line that operates between Guadalajara and Tequila. You can purchase your tickets online ahead of time or wait until you get to the old bus station in Guadalajara. Since buses depart Guadalajara every half hour and are rarely full, you’re likely to be able to board the next departing bus. Most people do not buy their tickets ahead of time but wait until they arrive at the station. 2. Take the Chapala Plus direct bus from Ajijic or Chapala. There are a couple different classes and routes that the buses take to Guadalajara, so to ensure you’re on the right one it’s probably best to board at the station in Ajijic or Chapala, instead of one of the many stops along the highway. From Ajijic, take the direct first-class bus which bypasses Chapala and heads to Guadalajara via the libramiento, taking about an hour to reach the “old” bus station there. When you get to Guadalajara, you’ll be dropped off at the north wing of the old bus station, the antigua central camionera. All you need to do now is cross to the other side of the station to find the ticket counter for Tequila Plus. Round trip tickets are around $200 pesos per person depending on the class of bus. Get the latest delivered to your inbox about what's going on this month at Lake Chapala. Culture, fiestas, traditions, art, history, photography. Mexico. If you decide to take the van tour to Tequila with The Victoria, your morning starts at 8:45 a.m. with a shot of coffee liqueur in the hotel garden. The 15-passenger van takes you quickly to the agave fields in under 90 minutes. ...with views of agave fields in all directions. To the west, you'll see the extinct Tequila Volcano (9,580 ft) and its hardened core protruding at the center of the summit. A boy in Pátzcuaro, Michoacán, performs La Danza de los Viejitos, the Dance of the Little Old Men, a traditional dance from Michoacan. Throughout the day, a licensed Jalisco state tour guide (pictured is Jorge) will teach you about the history of tequila and its production. These agaves are a few years old. A mature agave reaches eight years or more before it's ready to be harvested to make tequila. Only blue agave is certified for the production of tequila. Since it can take so long for a blue agave to mature and reach the reproduction stage, the plant sometimes sends up offsets or pups nearby. The jimadores who work the fields carefully transplant these clones to an empty field. Next to the agave field is a restaurant and bar, where you can order a mid-morning drink and listen to the tour guide talk about how the agave is harvested. The next stop on the tour is the Tequila Selecto distillery in Amatitlán, about 20 minutes south of the town of Tequila. 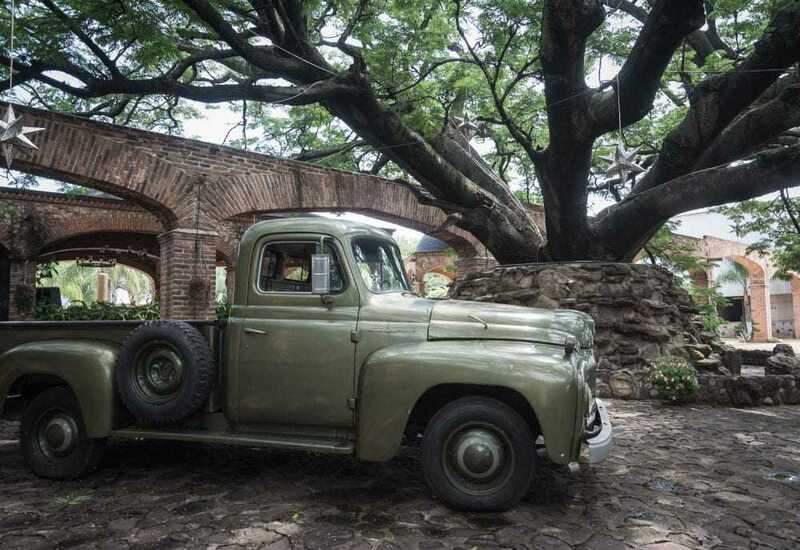 There are several old trucks on the property and shady jacaranda trees. Once the harvested agave piñas arrive at the distillery, they are cooked in these giant pressure cookers. This converts the carbohydrates in the plant into palatable sugars. This is what an agave piña looks like after it's been cooked. This is how the agave piñas used to be mashed, with a tahona stone wheel that weighed up to several tons. Some tequileros still use this method. The tahona was attached to a central pole and led in a circle by a burro, horse or mule. Pictured here (not on the van tour) is Maestro Tequilero, which you can visit after the tour if you wish as it's in downtown Tequila. 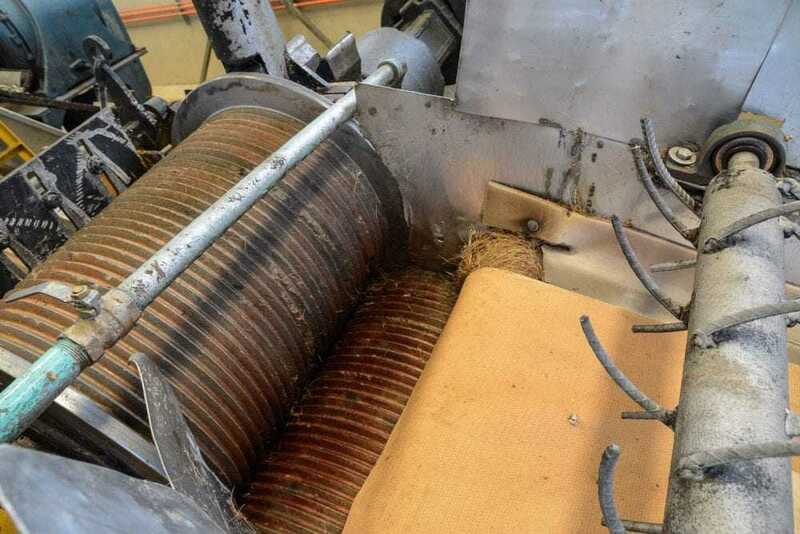 In order to meet today's international demand, most tequila distilleries, including Tequila Selecto, now use machines to do the mashing. The piñas are loaded onto this conveyor belt. They're then mashed between these heavy metal rollers. Once the agave juice has is extract, it's put into these 30,000-litre fermenting tanks. Depending on the desired outcome, agave juice might be left to ferment between two to 12 days. One tequilero uses Mozart and the Mozart effect to help its agave juice ferment. After fermentation is complete, the agave juice is distilled through steam and heat in the distillation stills on the left. Tequila must be distilled at least twice according to law; some are triple distilled. The first distillation takes about an hour and the second takes three to four hours. Now the tequila must be aged in these oak barrels in order to bring out its full flavor and color. Blanco tequilas don't need to be aged, though some are aged for up to 59 days. Tequilas aged 60 days to one year are classified as reposado. Añejo tequilas are aged for one to three years. Extra añejo, a relatively new classification, is aged for more than three years. Once the tequila has been aged, it's finally ready for bottling. Workers use computer-calibrated equipment to bottle one of Tequila Selecto's varieties of tequila. Like many tequileros, Tequila Selecto produces multiple brands of tequila. Each bottle is filled to the same height and capped before getting shrinkwrapped. Then the bottled are labeled and packed. With 213 million liters of tequila exported from Mexico in 2017, much of this tequila is shipped to an international market. After the tour of the distillery, you'll head to the bar. The time should be just past noon, so you can start drinking now. ...which, as you can see, are many. After you'll sufficiently, it's time for lunch. For an additional charge of between $100 to $200 pesos, you'll eat lunch at a nearby restaurant. After lunch, the tour continues to the town of Tequila itself, where you'll be dropped off to explore the central area for an hour. If you are on the van tour, you'll only have an hour, s you won't have time to see much in Tequila. But the National Museum of Tequila only takes 15 minutes to walk through. Some of the hundreds of bottles of tequila on display at the National Museum of Tequila. Some of the tools used in the harvesting of agave, as seen at the National Museum of Tequila. Visit Maestro Tequilero for a look at some preserved parts of an distillery. Sauza is also another distillery you can visit which is in central Tequila. Inside the grounds at Casa Sauza. Mexico has a rich history of mural art. This mural depicts the production (and after effects) of tequila. Visit Mundo Cuervo if you're a Jose Cuervo fan. The barrel is decorated with huichol bead art. Sometimes you'll find the voladores de Papantla performing in the town plaza. Jimadores jimar agave plants in a field in Arandas, which is east of Tequila a few hours in the highlands or los altos of Jalisco. Los altos is another area of Jalisco highly dependent on the production of tequila. A mule and a jimador transport freshly harvested agave piñas in a field in Arandas, Jalisco, Mexico. Jimadores and mules transport these massive agave piñas. The agaves are transported by truck to nearby Tequila Cazadores to be made into tequila. Back in the "lowlands" of Tequila, Cholula (yes, named after the hot sauce) is a popular spot for lunch. Cholula hot sauce is licensed by Jose Cuervo (who's Mundo Cuervo museum is just across the street). Inside Cholula restaurant with a mariachi group playing for a table of customers. Or get some tacos from a taquería on the street. This 19th-century cemetery-turned-historical museum is something to do in Guadalajara that will take you off the beaten path. A $60 USD ticket & a few hours on a first-class bus take you a hop, skip & a jump east of Lake Chapala & into the land of Michoacán. Tapalpa, one of Mexico’s 121 “magic towns,” is located in the pine-covered mountains two hours southwest of Ajijic. Sergio Hernández and Kode Rodríguez perform a dance in the ruins of an old fort on Mezala Island in Lake Chapala. A woman dressed as a catrina of Frida Kahlo on the Day of the Dead in Chapala, Mexico. Do you ♥ this? Share it with people you know.